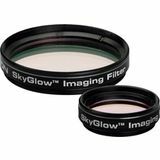 SkyGlow Broadband filters enhance deep-sky objects in moderately light polluted skies. They block the most common wavelengths of light pollution for increased contrast and better views of all deep-sky objects, without needing to drive to dark skies. 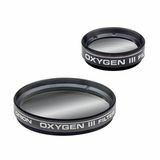 The Orion 13% Moon filters help reduce glare on the moon's surface so you can see more detail and features. 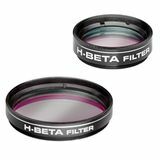 These filters are especially useful to owners of large-aperture telescopes. It threads directly onto the eyepiece barrel. 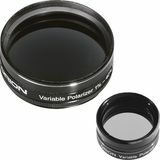 Orion Variable Polarizing Moon filters act like a dimmer switch for your telescope, allowing the perfect amount of light to come through. Whether the Moon is full or a thin crescent, you can adjust to reduce brightness and glare to bring out details. 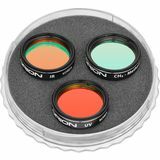 Orion Oxygen-III filters show amazing detail when viewing nebulae. Completely blocks all other visible wavelengths to boost contrast on emission and planetary nebulae as well as supernova remnants. A bigger contrast boost than the UltraBlock filters. Hydrogen-Beta nebula filters are perhaps the only way to see the faint and elusive Horsehead, California, and Cocoon nebulae. These filters pass light that these faint nebulae emit. 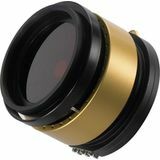 Best used with medium to large aperture telescopes in dark skies. For highly light-polluted sites, the UltraBlock Narrowband Light-Pollution Filters are perfect. 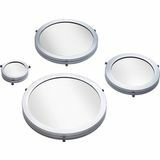 They block all forms of light pollution, allowing you to see fainter deep-sky celestial objects over unfiltered and wideband-filtered views. 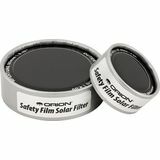 The Orion Safety Film Solar Filter for Reflector Telescopes are made with high-quality Safety Solar Film, which are made specifically for safe observation of the Sun through a telescope. 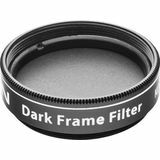 Optimize your astrophotos and completely eliminate camera noise and "hot pixels" with the 1.25" Dark Frame Imaging Filter. 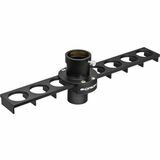 It blocks all light from your camera's imaging sensor, making accurate dark frame acquisition easy. 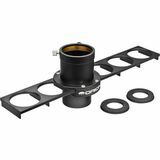 Quickly switch between up to eight 1.25" eyepiece filters with this handy 8-Slot Filter Slider attachment, without the hassle of having to remove and replace individual filters. 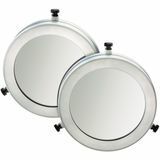 Use this handy 2" filter slider to quickly switch between up to six 2" eyepiece filters to enhance and improve your views without the hassle of repeatedly removing and replacing an eyepiece to switch individual filters. 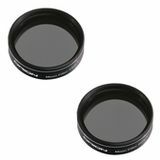 This set of three imaging filters includes the most vital filters for optimizing monochrome planetary portraits. 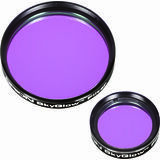 Set includes an ultraviolet (UV) filter, infrared (IR) filter, and methane (CH4) filter. For astrophotographic use only. 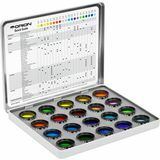 This Premium 20-piece Color Planetary Filter Set includes our most complete assortment of 1.25" color filters to help enhance observations of the Moon and planets. 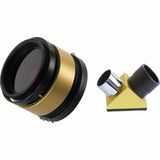 Compatible with Orion 1.25" eyepieces, 1.25" filter wheels, and 1.25" filter sliders. By using a filter to selectively block and transmit portions of the visual spectrum, you will notice a huge difference in the amount of detail you're able to see in astronomical objects. 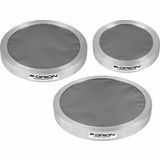 Moon, solar, planetary, and light pollution filters from Orion Telescopes are image-enhancing staples that you will use almost every night out. 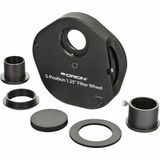 And Orion carries a variety of more specialized narrow-band filters that will appeal to advanced observers and astrophotographers.